Acacia honey combined with a blend of rose extracts helps restore flexibility, shine and volume. I’ve been trying for 7 years to make my hair look as full and beautiful as it did before chemo. I’ve used kerstase, other expensive products for thin hair and there is NO comparison. This shampoo makes my fine curls look voluminous and soft and bouncy. I’m beyond thrilled. best shampoo EVER!! I have thin hair and it gives it volume and uplift. LOVE, LOVE IT. Worth every penny!!!!!!! The vast majority of shampoos irritate my scalp, but this one does not. It also leaves my hair soft and so shiny it’s practically metallic. As an added bonus, I love its honeyed rose scent. I took one star off for price, but I will say that a bottle does last a bit longer than one might think. For my waist-length hair it only takes two, dime-sized blobs. Love the smell of this shampoo I just didn’t think it worked well with my dry damaged hair, but it was a nice shampoo for my daughters hair. This is my absolute favourite product. It is the very best shampoo (it works wonders for my problematic thin, fine wavy hair and very sensitive scalp) and as an added bonus has a magical scent. Love it! This is truly the best shampoo for the frequent use. It gives moisture and volume, and has a divine smell. It has been my staple shampoo for many years, and I absolutely love it!!! I like the shampoo that keeps my hair in perfect balance..! I absolutely Love this shampoo. I have very fine hair and it gives me wonderful volume. It feels like putting honey in my hair. Love it! I do wish it lathered and I could use less per shampoo, but I’ve seen better volume in my hair and been getting compliments on how shiny my hair is! I don’t know what its real effect is, but after several month using this little one, my barber reminded me for my hair increasing. That’s enough for me. This is the most expensive yet the best shampoo I have ever used. I tried the small bottle first which doesn’t lather. It is not a nice experience but it still does the work to volumize my hair. So I bought the professional package — the big one! It is the best choice I made for shampoo. It lathers and cleans so well. I don’t need to wash my hair every day but my hair still has full body after two days. I love the smell and the gentle feeling of the shampoo. I use the Shampooing au Miel after the Regenerescence Naturelle. It helps to further TLC my scalp and hair in a very gentle manner. It’s a great partner. They’re great together! After my scalp become really healthy using Bain Traitant a la Propolisi, I tried this product and decided to use it for life.If you are looking for healthy scalp, healthy hair, this is definitely the one. If you were like me who like researching and trying different brands, this product will serve as your destination. It is impossible in the future i will switch to another brand. Never thought this shampoo will work for me. It’s great product ! 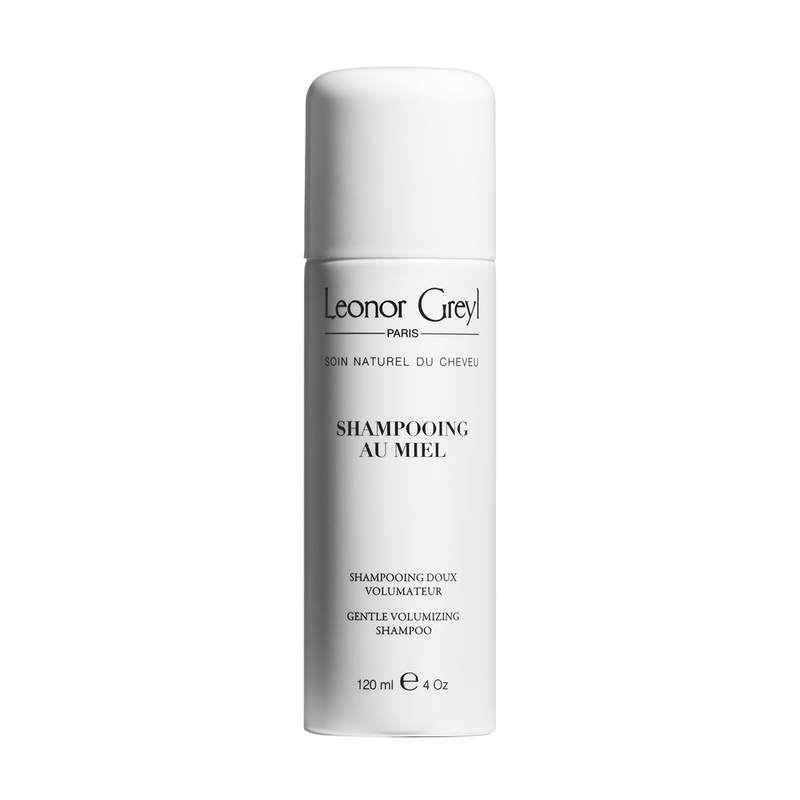 I have been using it for so many years now.perfect shampoo for every day wash should you need it.Leaves your hair shiny and soft.So gentle to your hair.Love it as all the Leonor Greyl line of products.Would love their professional size bottle be available on regular basis though. I’ve only started using it but I’m seeing notable changes to not only my hair but also scalp. My hair looks healthier, fuller and the added perk of eliminating my mild case of dandruff. Expensive product but worth every penny and small amount of shampoo goes a long way. I don’t feel like I need to use a lot to get a nice lather. Before I purchased this product,i did some research and this shampoo didn’t disappoint me.It smells good and the texture is light. Fabulous shampoo – cleans, nourishes, adds shine. Although the bottle is small, I need to use very little for my thick, fine, to the middle of my back hair – perhaps because I use it after Bain de Propolis, following LG recommendation to wash twice if you don’t wash every day (plus, I use the pre-treatment oil)! My favorite shampoo from LG, gentle and makes my fine, colored hair shiny with volume but soft and clean. The smell is very nice too. I find it to be one of the best shampoos and wish it came in larger size. I love this shampoo! It saved my thinning hair. In France, this shampoo has a bigger family size,1000ml. I hope LG in US will also have this family size. I have tried Leonor Greyl unique hair cleaning method, and I am loving it. I first applied Huile de Leonor Greyl and combed it through. Then, I shampooed my hair with Shampooing au Miel. I kept adding water and massaging. Finally, I put on Masque a l’Orchidee and detangled my hair with a comb. After the treatment, my hair instantly feel better and have more shine! I love this shampoo! It has fancy flavor, efficiently saved my thinning hair. It works better with Regenerescence Naturelle and Complexe Energisant. My hair really grows! I wish I could get the large size one. This is not the most expensive shampoo that I used. However, it really works!! Now I have already used three bottles of this shampoo, and my hair will never ever stuck at the drain and prevent the water from leaking away in my bathtub. My mother and I both use this product. Every time after I shampoo my hair, it always turns out to be shiny and elastic. Lovely, simple shampoo, especially if you have fine hair that tends to get greasy fast and need to wash daily. I found this to be gentle enough for daily use. Love this shampoo. It provides instant results! I know it provides all the nutrients to help build my hair without harsh damaging chemicals. This is a necessity for building your hair volume! Worth every penny. I am a TOTAL Leonor Greyl believer! The products are excellent! Love this product. I have always had bad hair, thin and straight, plus a severe thyroid problem. This shampoo is wonderful! My hair is so much better and not falling out! I wish it came in a bigger bottle, I hate to have to keep ordering so soon. I have been using this product for 2 months and love it! I too have had really bad hair for years because of a thyroid problem. It has made such a great difference in my hair. I wish it came in a bigger bottle. I don’t like having to order so many times!! This shampoo is wonderful. It does not take a lot to lather and gives great body. Lenor Greyl has finally given me great hair. They are truly the Holy Greyl of hair products. I love the feel, smell and texture of this shampoo. My hair and scalp feel squeaky-clean but not stripped. It helps with frizz, and my hair is more manageable with this shampoo. I wish it came in a bigger bottle! This shampoo was part of the sample pack. I LOVE IT! My hair looks great and stays in place all day. I tried too many different hair products, and never could find The Right one. Now I am a breast cancer survivor, and this shampoo, as well as all Leonor Greyl products are the only ones I use, because they are natural and SLS free. I learned that SLS is very highly suspected in breast cancer, so I really suggest Leonor Greyl products because they are natural! Stop using aggressive detergent on your hair and body, for your health, your well being and your beauty! Thank you Leonor Greyl to stick with your philosophy of natural ingredients! I have thin hair, and I lose a lot of it – or rather I should say I did in the past. Since I discovered LG five years ago, my hair hasn’t been falling out at all. I used to gather a hand full of hair every day, but since I started using this product maybe one hair falls out, if that. My hair has also been more manageable and full. I am a loyal LG customer, and if the company doesn’t mess with the formula, I will continue to be a fan. I love this shampoo! Thank You! My wife uses this and she has very fine hair. She calls it baby hair. I think she’s nuts cause it doesn’t look like baby hair at all, but I know what she means…For many years she could not find a shampoo and then suddenly she “discovered” Leonor Greyl and struck gold. Not only is she happy but so am I. For all you men who are dumbfounded by all the atrocious products out there and don’t understand why it is that your woman will be able to use a shampoo one month, but then not again the next month — will appreciate this. This is a consistent shampoo that works well and does not dry out or make hair brittle; it has had a tremendous impact on my wife’s hair and confidence…and well, everything else in between. Thank you, Leonor Greyl. I’m off to purchase stock. I am a hair product enthusiast, and have tried so many products over the years. A salon I used to frequent carried this line, and so I had used it regularly about 7 yrs ago. Then, my hairdresser left that salon, and so I just starting using the line they carried at her new salon. I have a lot of fine, straight hair, that I color regularly.. so I am pretty excited when I find a natural, great smelling shampoo that adds loads of volume. I had sort of forgotten about this shampoo until I came across a vendor on amazon that sold it! I am so happy to be reunited with Leonor Greyl…. I also use the magnolia oil as well… both products have amazing aromas, and fantastic performance. I would say all hair types could use this gentle shampoo, and you will absolutely love the smell. I borrowed this shampoo from a friend awhile back and didn’t think much of it until I went to style my hair. Immediately I noticed that my hair was more manageable – no flyaway hair, more shine and my hair feels bouncy. A little more $$ than I’d like to spend, but I don’t wash my hair everyday and the results are noticeable enough that I can’t say no!! I have been using this shampoo for years, it’s perfect for my hair which is healthy but thin. The texture is light, it smells great and it makes my hair look full. A simple, everyday shampoo that feels great on my hair. In 1982, Leonor Greyl launched the market’s very first honey-based shampoo. Having treated oily, colored and permed hair, Jean-Marie Greyl had turned his attentions to finding a gentle solution for everyday washing. He chose to combine protective rose and acacia honey, using an extra mild cleansing base and plant-based proteins for added volume. Designed to be used by the whole family, the Shampooing au Miel visibly perfects hair and soon became one of the brand’s cult products.